You see, this week was the 27th anniversary of when I graduated from The Culinary Institute of America - 17 May 1991. The CIA, as it is referred to, was a former Jesuit Seminary. Pierre Teilhard de Chardin a Jesuit himself, whom Most Rev. Michael Bruce Curry referred to in his sermon at the Royal Wedding, is buried on the property of the school and former St Andrew's on the Hudson. 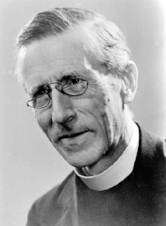 de Chardin as Bishop Curry noted, "was at once a scientist, a Roman Catholic priest, a theologian, a true mystic. His was one of the great minds and spirits of the 20th century. He suggested that the discovery and harnessing of fire was one of the great technological discoveries of human history. Fire made it possible to cook food, thereby reducing the spread of disease. Fire made it possible to stay warm in cold climates, thereby marking human migration possible. Fire made the Bronze Age, the Iron Age, the Industrial Revolution possible." In light of this, de Chardin said that if "human beings ever harness the energies of love, then for the second time in the history of the world, we will have discovered fire. Love is the very fire and energy of real life!" I find it ironic that de Chardin refers to fire in terms of cooking as he is interred on the grounds of America's foremost school of cookery. Doubly ironic is that he compares fire to love. I have been looking to rekindle the love of cookery and food that I found within those walls. That is what this journey is all about. There is no doubt that I love food and creating it. The many tomes of books that line my shelves are a testament to to that idea. The ultimate goal is to keep that fire burning and that love growing enough to create a body of work that pays homage to this food that I love so much. This story came full circle this week when my son asked if I could bake something for after prom. I figured that brownies, the same brownies that I learned to make at the CIA, were the perfect choice seeing as how it was the anniversary of my metriculating. They bring me back to a special time in my life. They make me recall the good times that I had while being there at the school. They help rekindle that passion, that fire, that love that brought me there. For me, food is just one of the things that fuels me with the energy of real life. So here is the next step of this blog. The part where I actually start posting recipes. Melt unsalted butter over medium-high heat. Once simmering and all of the butter has melted, pour over chopped chocolate and stir with a whisk to melt chocolate and make a homogenous mixture. Set aside. Combine eggs, sugar, and vanilla in a mixing bowl. Set over a double boiler on the stove. Heat mixture to 110°. Stir to make sure sugar has dissolved. With an electric stand mixer, whip egg mixture until doubled in volume and is holding a light tread from the whisk attachment. Fold in flour and half of the chopped walnuts. Spread batter in a greased parchment lined 1/2 size sheet pan. Sprinkle remaining chopped walnuts on top. Bake in a 350° oven for 30-45 minutes depending on how fudge like you prefer your brownies. Can be topped with ganache (equal amounts of melted chocolate and boiled heavy cream) for even more decadence. Created using The Recipes Generator Create beautiful and printable recipe cards for your recipes. It works with Blogger, SquareSpace, Wiz, Wordpress, and any other platform you could think of. The best recipe plugin for Blogspot and Squarespace. Use this tool to add a printable recipe card for Blogger.